Rajlakshmi heads the global marketing efforts and has over 19 years of diversified experience in advertising, direct marketing, digital marketing, event management, PR, corporate communication and marketing advisory & consulting. 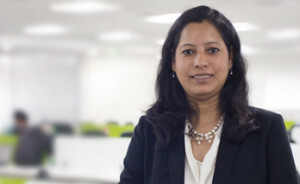 Prior to joining Attune, she was associated with TalentSprint, Region Holdings, Ajuba Solutions, Eventus India, McCann Erickson and Procter & Gamble. She has a keen understanding of both B2B and B2C products and services, and carries a wealth of experience from early-stage as well as large companies. During her stint in Ajuba, Raji won industry awards from NASSCOM and World HRD Congress for employer branding initiatives. She has experience in leading teams and owning P&L responsibility. At Attune, Raji is responsible for driving the global marketing initiatives. She is involved in defining strategy and executing activities for corporate branding, PR visibility, social media & content marketing, digital marketing and lead generation. Raji is an INSEAD alumni and has a Master’s degree in Mass Communication & Journalism from MS University, Baroda. Raji is an avid reader and her favorite genre is creative non-fiction. She has keen interest in acting and has worked in theater, TV and mainline films.